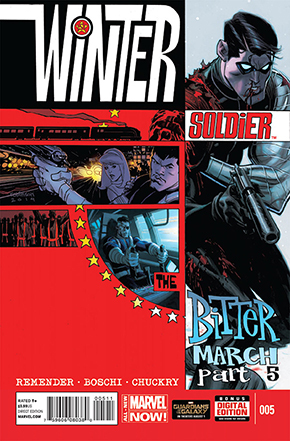 It’s the end of the mini-series, written by Rick Remender, to be a prequel companion piece to his ongoing Captain America run. Although the title has us believing that the Winter Soldier is our main character, it’s actually S.H.I.E.L.D. Agent, Ran Shen, who’s the star of the story. But if you’ve been reading Captain America, then you know just what lies in store for our hero. I wasn’t very into this mini when it first started, but Remender and Roland Boschi give a very satisfying ending for this dark period spy piece. We start this issue with Nick Fury, who we haven’t seen since issue 1, searching for Shen who is living off the grid with newly recovered Bucky Barnes and Mila Hitzig, the scientist holding the secrets to an alchemy formula, demonstrated by the Drain from the last issue. With Fury and other enemies moving in on the trio, it’s only a matter of time till Mila must decide to either escape to freedom or join Shen in America under the protection of S.H.I.E.L.D. Shen is reluctant to trust Bucky, but that is his only choice if he wishes to get Mila safely out of the area. The issue ends with a gut punch that gives us insight into the man who would become the Iron Nail. Remender and Boschi wrap up this series nicely with issue #5, creating a solid, action-packed spy adventure. The great thing about this series is that even without reading the current Captain America run, it’s a fantastic stand-alone story that has a satisfying end. With the Winter Soldier, Nick Fury, Hydra, and gratifying flashbacks with Captain America, Remender continues to prove how good he is at not only at story-telling, but revealing the dark evolution of a character through the traumatic events that affect them.